There is nothing like a good old traditional Sunday dinner in England. I think that most households in England sit down to roast beef, Yorkshire pudding, roast potatoes and veg. And where would we be without the gravy? I remember when I was a child, my mother would always call us around one thirty, make sure we were all washed and neat, and serve us up the most delicious dinner. It was always the same, because we loved it. The roast beef was always just soft enough for our little mouths, and the Yorkshire pudding was gorgeous with gravy or, in my case loads of brown sauce! The potatoes always tasted of butter, and were soft enough but not too soft. And of course we have the vegetables. Brussels sprouts, green beans or peas and cauliflower or cabbage. Evidently Yorkshire pudding came into being in about 1737 as a way to fill up hungry bellies, because the population at that time were very poor. 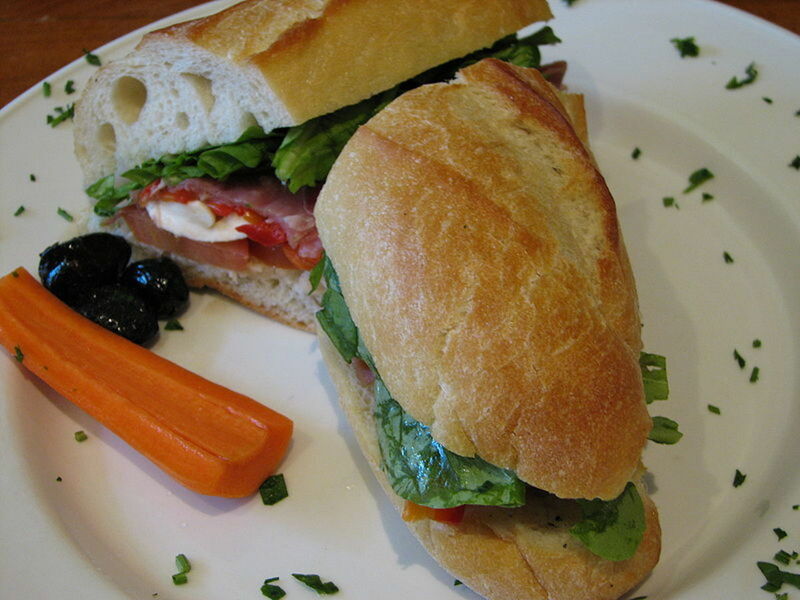 Now it is one of our favourite meal time foods. 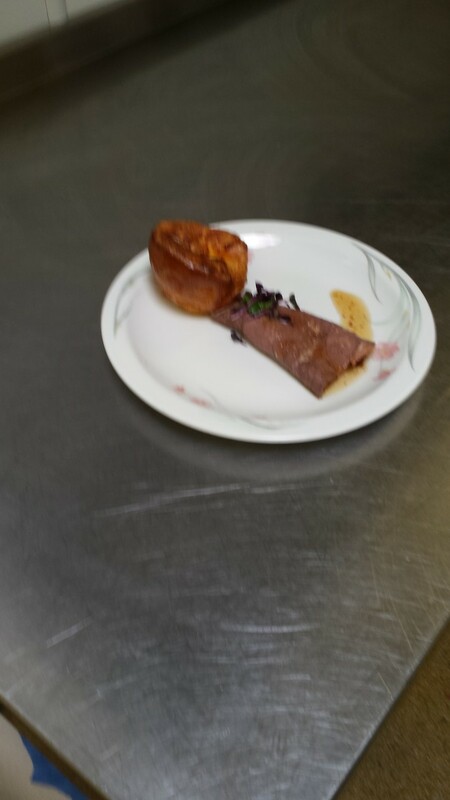 First we will start with the roast beef. Obviously this will take longer than the rest of the ingredients to cook, so must be put on to bake before doing the rest. 1. Preheat the oven to it's hottest setting, and wait for about ten minutes for it to heat up. 2. Prepare the beef by placing it in a roasting tin and rub or brush the surface of the meat with oil, salt and pepper to taste. 3. Then place the roasting tin on a hot hob or cooking ring, and turn the meat on to it's side to sear the meat before cooking. Sear means to seal the edges slightly before placing it in the oven. 4. Now place the beef into the oven, leaving it on it's highest setting for about 20 minutes. 5. 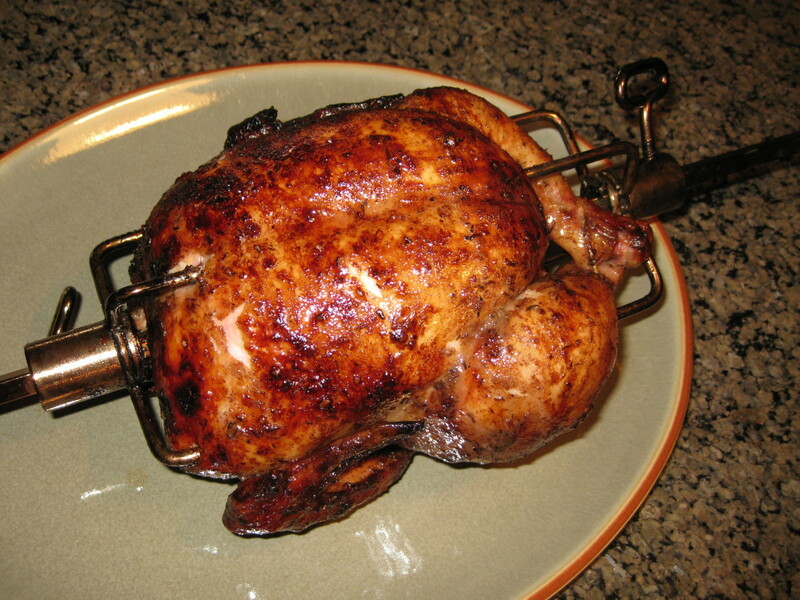 Reduce the heat from gas mark 8 to gas mark 5, and cook for half an hour per Kilo, which is approx 2 pounds. This is if you want to eat it rare. I prefer well done. So if you would like it medium rare, then add another 10 minutes. Medium cooking add another 20 minutes and for well done beef at least another 30 minutes. This timing starts only when you reduce your heat from 8 to 5. Not from the second you place it in the oven. 6. When the meat is cooked, remove it from the oven and cover it and leave for approx 30 mins while you are cooking the rest of the meal. This will give the meat time to settle. How to make Yorkshire Pudding. Some cooks say to leave this in the fridge to rest for up to 12 hours. I don't believe that is necessary as we have never ever done that, and it is fine. you can leave it for about half an hour to slightly thicken up in the fridge, or you can just continue to cook as usual. Before pouring the batter mix into a mould or pudding tray, even a roasting dish is fine, add a little of the beef dripping to the bottom of the pan, making sure it is warmed up first so that it doesn't look or feel greasy. Then pour the batter over the top. The beef juice is not a necessity, you can just use the batter, it will turn out just as nice. The dripping is just for extra flavour. Of course if you are going to pour gravy over everything when it is served, then the beef juice can be added to the gravy instead. Bake for 25 minutes. When it is golden brown then take it out of the oven. Try not to open the oven for the first 20 minutes of cooking, you don''t want a flat Yorkshire pudding! 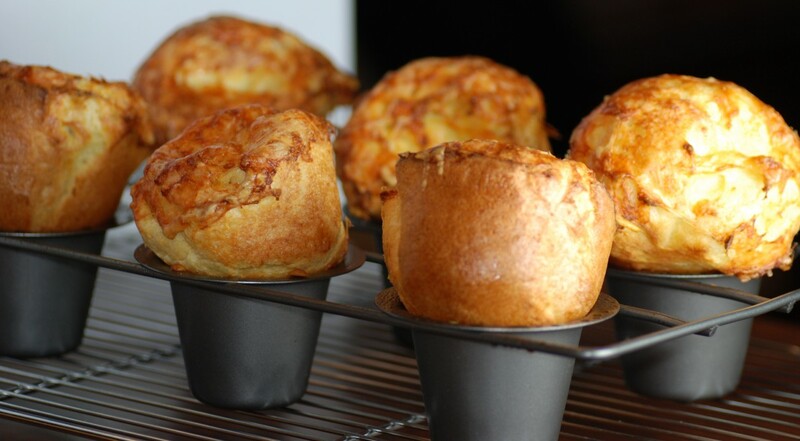 Of course you can experiment and use small cake tins for the Yorkshire pudding, or you can buy Yorkshire pudding tins to make them small and round. But I prefer it cooked in a baking tin. This way you can cut as much as you like off of the whole and eat more! We all know how to roast potatoes, but there are certain things that you can do to make them just right. I always boil my potatoes first, for about 10 to 15 minutes with a pinch of added salt to taste. I know some people just place the potatoes in the oven, but I much prefer doing them this way. When it is time to put them in the oven, strain away the water and place them in a baking tray. I usually wait until the beef is nearly done, then add the potatoes to the meat. This gives them a lovely flavour, as the meat juice will then soak into the potatoes. For an added touch, I usually place a small teaspoon of butter on each potato before placing them in the oven. Then cook them until they are golden brown. Yum! 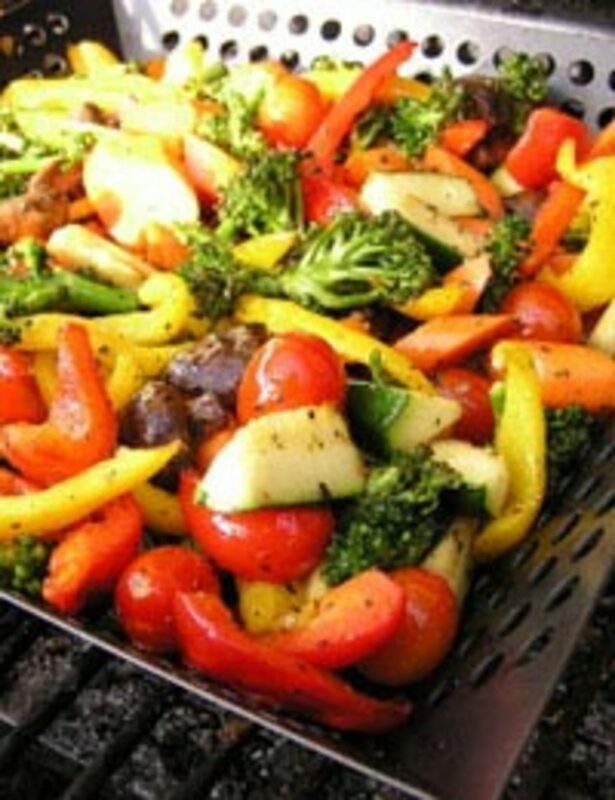 Now that you have cooked the main part of the meal, you can add any vegetable that you like. Make sure that you peal and cook the vegetables just after placing the meat in the oven. You can cook them a number of ways. One, the conventional way, on the top of the stove in boiling water, or if you prefer, steam them. Or, and this is really nice, if you would like the added flavour of the meat, wait until they are nearly cooked, then remove the baking tin from the oven, add the potatoes and then last of all, drain the water from the veg and pour the vegetables over and around the meat for about 10 minutes until the meat and potatoes are cooked. A last little trick that I always find makes the meal taste even scrummier, is just before your remove the roast from the oven, and after you have added the veg and potatoes, make up a generous amount of gravy, and pour straight onto the meat and veg, letting it sink into the food. Pop it all back in the oven for another five minutes and then take it out. The gravy will have soaked into the food enough to make it lovely and tasty, and not leave too much liquid to ruin the meal. If you want it to really sink in, leave it on a low gas and wait another ten minutes. That's if you can wait that long! Hope you enjoy it! English Recipes and Kitchen Goodies! I remember many family dinners at my grandmother's with just about the same menu. My grandma would make pot roast and Yorkshire pudding. I voted up+++ I am so hungry now that I will sin by eating something I should not. That looked so delicious I could almost smell it. I had some Yorkshire pudding once at my grandmother's best friend's house when I was 12 years old. I cannot remember if I liked it or not, but I am ready to try it. Hi Peggy, glad you liked it, and yes yorkshire pudding is scrummy! lol! Hi Jools, yes a bit early for a full on dinner! lol! thanks! Hi LaThing, I love my Sunday dinner! lol! thanks! i love this Nell!! im now craving for this recipe. How did I miss this delicious hub? It sure is "scrummier" than plain old roast beef! Not only is the food looking and sounding delicious but you wrote the whole thing in your inimitable style making it fun to read. Nell, you make it sound so easy!! I have to try your way of making Yorkshire Pudding...... Looks lot easier. Will be trying it on the weekend :) Sunday Dinner! Oh my! This sounds delicious!!! I think I have only made Yorkshire pudding once in my life and we liked it. Had forgotten about it and your hub reminded me that I need to do it again. I do like roasting potatoes and veggies with the meat. Just adds to the flavors of both. Up votes and tweeting. Hi Deborah, thanks so much, I can't wait to see what Michelle is up to now! lol! Nell I love this..so glad I found this on Facebook.. so delicious.. I am posting it on cooking time on Facebook.. I will make sure you are invited. I get most of my news pretty quick right here with yahoo for my homepage. Headlines, so I never thought about it but it keeps me pretty on top of stuff. Hate their toolbar though. Well let me know if you hear anything for sure OK? Or I will you, lol. Oh I saw a report where she kept touching or patting her stomach (I forget how many time they said it was, but many) as if giving comfort, so it sure sounds like! Wow, I didn't see this, looks delicious, will mark it. Did you hear about Kate might be pregnant? Oh I hope so and that they have a little girl...just thought of you soon as I heard it. Sounds delicious. I hope to try it soon, but what cut of beef do you use? It sounds like a boneless rib roast would work well. Any other suggestions? I was born in Yorkshire, but have never been able to quite get the knack of making Yorkshire puddings the way my Grandmother did. I'm going to try your recipe and see if I get a better result! Hmmm.... these look so yummy ! You are such a great cook ! This is just perfect. I'm adding a link from my continuing story - the episode where a character cooks roast beef with Yorkshire pudding. This will add the finishing touch. I will come back to it the next time I cook a roast dinner. I haven't had Yorkshire pudding in so long I think I probably should make it. 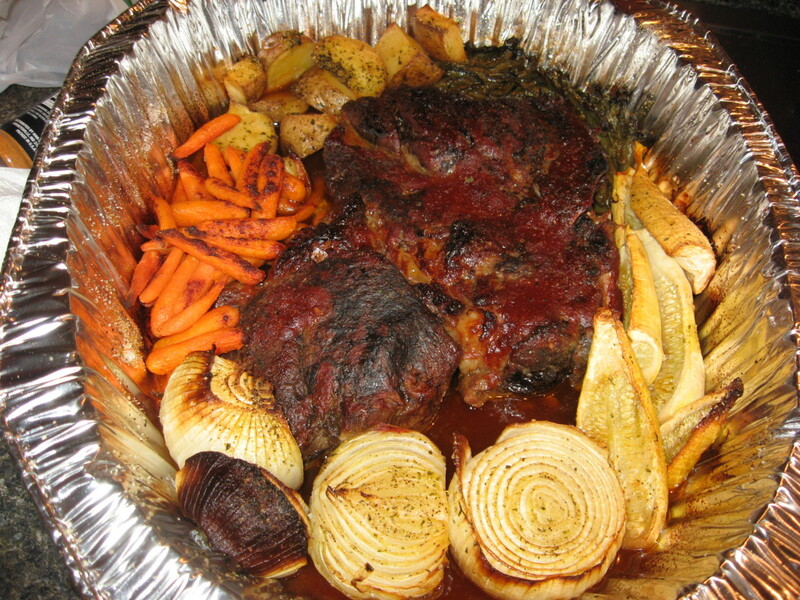 I love roast beef and never think to make the Y-pudding! 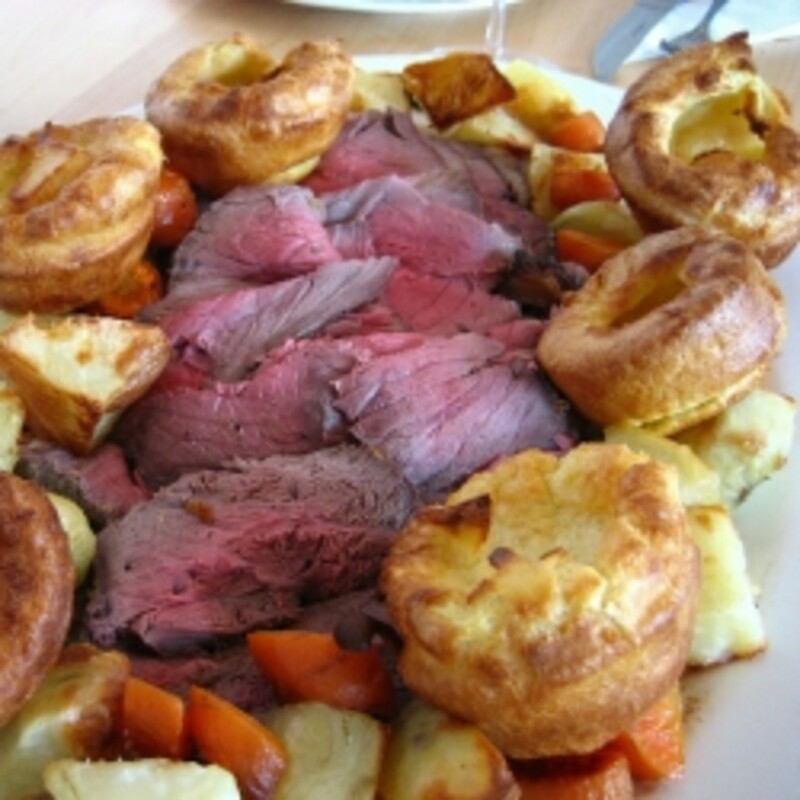 Roast beef dinner without Yorkshire pudding just isn't a roast beef dinner. I love all the trimmings that you added here Nell. 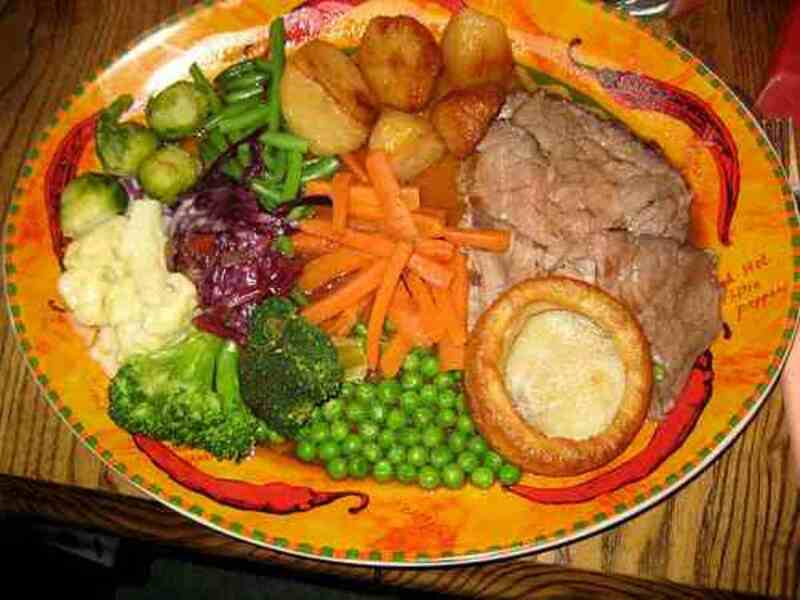 My mouth is watering, have to go out and buy some roast beef and get to cooking, must have the gravy as well. I can eat a tray of Yorkshire pudding alone, love it, just simply love it. Thanks for the great hub and pics to give us a taste...yummy hub. You wrote this hiub so well my mouht is dripping and watering. I have never seared meat before baking.It makes sense.I am hungry for roast beef,i wonder why? Great hub.Thank you for sharing. 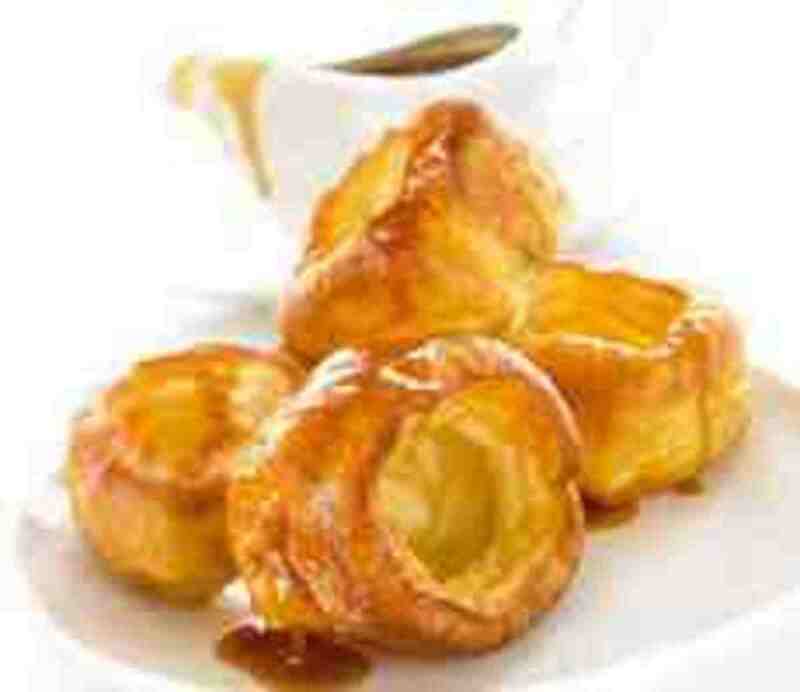 I have never had, but have always wanted to try Yorkshire pudding. Now, I have a recipe for an entire meal. Thanks! Nell, another good one. I thought the pudding was hard to make. It sounds pretty easy. I'll have to give it a try! Oh Nell I wish you wouldn't make me feel so hungry with these delicious recipes of yours and to tantalise me even more you publish a picture of the meal as well. All jokes aside, I love all your hubs Nell, you have such a varitey of topics. A sign of a brilliant writer I think. We are getting ready to roast a turkey, but now I want yorkshire pudding. What will I do? Yummy! Delicious, I am going to try the veggie trick. Until now i normally steam them, but this sounds dummie to me. thanks for the ideas! That really looks very nice. I was especially impressed by your suggestions for the roast potatoes. There is simply nothing better, simply yummy, scummy. This is truly the best of hearty and satisfying meals. When I make Yorkshire pudding, I do it according to your instrutions but in a hot cast iron pan where I've poured the beef drippings. What a fabulous feast! Thank you.